• Parotid enlargement is classical feature of sarcoidosis. • Clinically apparent parotid involvement occurs in <10% of cases. • Bilateral involvement is the role. • The gland is firm, smooth and not tender. • Other manifestation can be Xerostomia. • Sarcoidosis of the scalp presents with diffuse or patchy hair loss. • Increase in Vitamin D production: Macrophages inside granulomas convert Vitamin D to its active form, resulting in elevated level of hormone 1, 25-dihydroxyvitamin D.
• Symptoms: fatigue, lack of strength, irritability, metallic taste, temporary memory loss or cognitive problem. • Physiological response: suppression of parathyroid hormone levels. • This condition may be aggravated by high level of estradiol and prolactine such as in pregnancy. • High level of vitamin D is also implicated in immune system dysfunction. • Hyperprolactinemi found in 3-32% of cases. • The reasons for increased prolactin levels in sarcoidosis are uncertain. • Prolactin has been shown to be produced by T-lymphocytes in some autoimmune disorders in amounts high enough to affect the feedback by the hypothalamic dopaminergic system. • Neurosarcoidosis may occasionally cause hypopituitarism, but has not been reported to cause hyperprolactinemia. • Female patients have a significantly elevated risk for hypothyroidism, hyperthyroidism and thyroid autoimmunity, and autoimmunity appears to be very important in the pathogenesis of thyroid disease in this population. • The association is less marked, but still significant, for male patients. • Thyroid granulomatosis is uncommon. • Sarcoidosis has been associated with celiac disease. • An association with type IV hypersensitivity has been described. activated lymphocytes and macrophages, with increase production of key inflammatory mediator; TNF-alpha, TNF-Gamma, and IL-12 characteristic of Th1- polarized response (t-helper 1 cell response). • Sarcoidosis has paradoxical effects on inflammatory processes; it is characterized by increased macrophage and CD4 helper T-cell activation, resulting in accelerated inflammation, but immune response to antigen challenges such as tuberculin is suppressed (The anergy). • While TNF-alpha is widely believed to play an important role in the formation of granulomas, sarcoidosis can be triggered by treatment with the TNF-alpha antagonist etanercept. Langhans giant cells as part of a granuloma. Diagnosis of sarcoidosis is often a matter of exclusion. 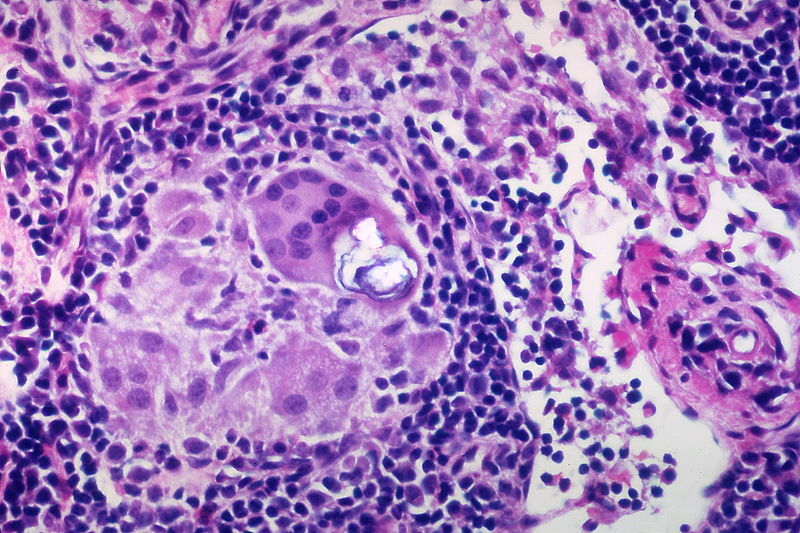 To exclude sarcoidosis in a case presenting with pulmonary symptoms might involve, chest x ray, CT scan, PET scan, CT-Guided biopsy, mediastinoscopy, open lung biopsy, bronchoscopy with biopsy, endotrachial ultrasound, and ednoscopic ultrasound with FNA nediastinal lymphnodes. 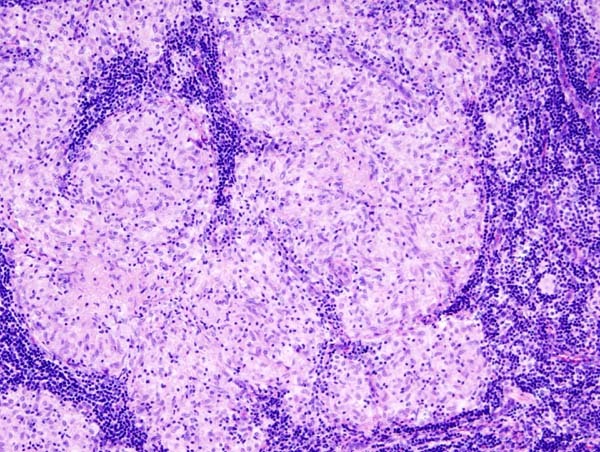 Sarcoidosis is confused most commonly with neoplastic diseases, such as lymphoma, or with disorders characterized also by a mononuclear cell granulomatous inflammatory process, such as the mycobacterial and fungal disorders. Very often, sarcoidosis presents as a restrictive disease of the lungs. • Stage 4: fibrocystic sarcoidosis typically with upward hilar retraction, cystic and bullous changes. • Between 30 and 70% of patients do not require therapy. • For patients presenting with lung symptoms, unless the respiratory impairment is devastating, active pulmonary sarcoidosis is observed usually without therapy for two to three months; if the inflammation does not subside spontaneously, therapy is instituted. • Corticosteroids, most commonly prednisolone, have been the standard treatment for many years. • Severe symptoms are generally treated with steroids, and steroid-sparing agents such as azathioprine and methotrexate are often used. • There have been some early indications of success interleukin-2 inhibitors, or anti tumor necrosis factor-alpha treatment (such as infliximab), unfortunately, none of these has provided reliable treatment, and there can be significant side effects such as an increased risk of reactivating latent tuberculosis. • Anti tumor necrosis factor-alpha treatment with etanercept in rheumatoid arthritis has been observed to cause sarcoidosis.